allegedly tortured by her aunt, Mrs. Ogechi Iruwane, Punchng reports. The mother-of-three was said to have used her bare hands to pinch off the victim’s chest, and inflicted injuries on her back. Ani was also reportedly starved for two days for allegedly stealing a piece of meat. Our correspondent learnt that a trader on Nurudeen Street, Orile Iganmu, Lagos State, where the incident happened, raised the alarm on Tuesday. 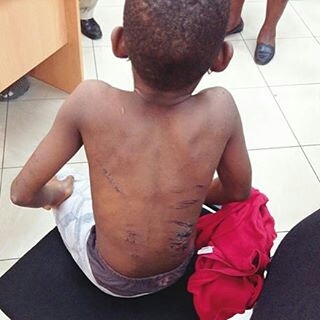 The case was said to have been reported to the Lagos State Office of the Public Defender. Officials of the agency reportedly apprehended the suspect and subsequently handed her over to the police at the Orile Iganmu division. The victim was afterwards taken to LUTH. A source at the OPD said: “Ani claimed she was 12 years old, even though she looked younger. She also looked malnourished. There were different scars on her back. The irony is that the suspect has three children and they look well-fed. The girl claimed that she is the 11th of 12 children. She said the woman came to take her from her parents in Enugu State in December 2015. She said she was in primary three before she was brought to Lagos, but since her arrival, she had not been going to school. She said the woman accused her of stealing a piece of meat and for about two days, she was not given food to eat.” The Police Public Relations Officer, SP Dolapo Badmos, confirmed the incident, adding that the matter would soon be charged to court.